Dodge Durango best truck ever. This Durango is the most vehicle I have ever had. It has a lot of room for the people and still allows plenty of room in the back for shopping. 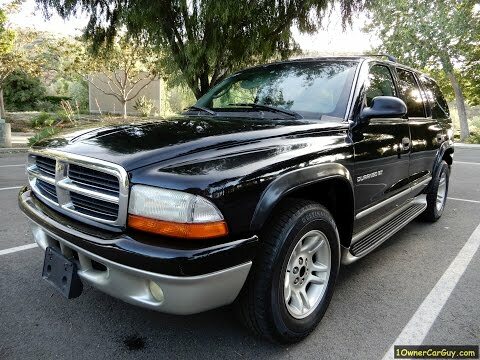 This Durango has required very little maintenance mainly tires and oil changes; I have had this truck 7 plus years and it was well worth the money it is positively one of the best trucks I have ever owned very dependable this truck has plenty of storage compartments besides the glove box has pull down armrest for drink holders I really love this truck it has never disappointed me I really love it. This Durango is a tank and can weather any storms. The 2003 Dodge Durango slt has great power and pick up and go! The engine is reliable and strong, very hard to kill these engines! As far as the rest of the drivetrain it is pretty bullet proof other than normal wear and take! This Durango is great know matter where you go or what you do! Any choice from hunting and fishing, camping and hiking, riding the trails, or long trip to family vacation destinations. This is the vehicle for the job do to its versatility, along with it is roomy and comfortable interior. Love My Durango! Bought as second hand but still looks like new!! Bought from a Dodge dealer and was a second hand car but it has lasted a good 6 years. We plan on using it quite a few more! The only problem I have with it are the shocks don't seem to work too well. We have been able to drive 500 miles with 5 adults and we had plenty of room. Our oldest granddaughter rode in 3rd seat and loved her privacy !! Maybe it's the age of the Durango, but my husband has had to add more windshield washing fluid recently. The gas tank is small, but that is expected on a small car.